Tim Kelley has been in public accounting since 1976 and established this firm in 1980. 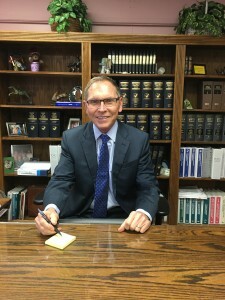 Tim provides tax strategies and business experience he has gained over more than thirty years practicing and teaching tax law. He obtained his BA from Cal State University of San Bernardino in 1976 and his MBA in 1981. Tim became a licensed CPA in 1979. He became a licensed attorney just after graduating from law school in 2000. We are more than just a full service accounting firm located in Riverside, California. At no additional charge, we provide you the advantage of being served by both a certified public accountant and attorney. If you have privacy concerns, this can provide increased privileged communication. Additionally, because of our superior education and training, we are better skilled in argumentation, representation and interpretation of tax law than the competition. All this gives you greater confidence that you are receiving the best work possible. What makes us even more unique is you receive the personal attention you need to get the very best product. For example, we do your tax return on a big screen in your presence so you can actually see what reduces your taxes. In most cases, your tax return is completed during your interview. Mr. Kelley, having been a college instructor, also gives you the advantage of dealing with someone who encourages your questions and gives explanations you will understand. For more than 30 years, we have been providing tax preparation, monthly bookkeeping, audit representation, tax and estate planning and many other legal and accounting services to a wide range of clients, including both businesses and individuals. We have developed a reputation for professional excellence through the high quality of services we perform for our clients.